Got HTC Desire Android 2.2 Froyo Update…? « Android Market – New Payment Options! 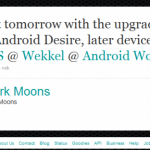 Published on July 29, 2010 in Android. It looks that the world got crazy because of rumors caused by yesterday tweet from HTC_NL that is official Netherlands twitter account. Moreover HTC webpage for China has been updated with information that HTC Desire phone will be shipped with Android 2.2. Both information has been confirmed by engadget - that may be considered as a trustworthy source of news. 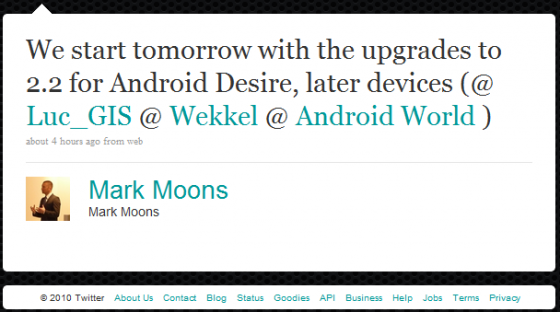 It will be first officially released Android Froyo with HTC Sense (there was a leaked version a few days ago for geeks with rooted phones). As we know from that version the phone will be much faster, will have HD 720p recording feature and possibility to install apps on sd card to save internal memory space. According to twitter "Froyo Update" subject is dominated by people that are hitting their refresh button again and again to get Android 2.2 update as soon as possible. I am one of those persons and I will update this post as soon as I will notice the update... And how about you...? Do you care about this update or maybe you have already received it...? UPDATE 1: According to XDA-Developers forum first updates are already here (for Dutch people like for now)! 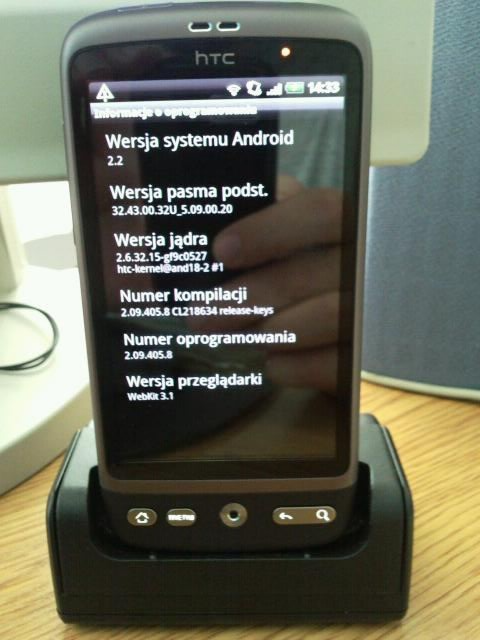 "The Android 2.2 (FroYo) update for HTC Desire will start rolling out across Europe this weekend. As well as including the complete set of Android 2.2 features, the update will contain a few special additions of our own through the latest iteration of HTC Sense. The update will provide 720p video capture, HTC's App Share widget, as well as our enhanced HTC Caller ID, and improved multi-language keyboard. Also, though the update, HTC Sync will allow HTC Desire users to sync their music with iTunes. HTC Desire users will be notified that the over-the-air update is available to download when their phone automatically checks for software updates. The update won't delete any of the phone's content. However, due to the size of the update, we would advise using a WiFi connection to download it wherever possible to avoid additional data charges. 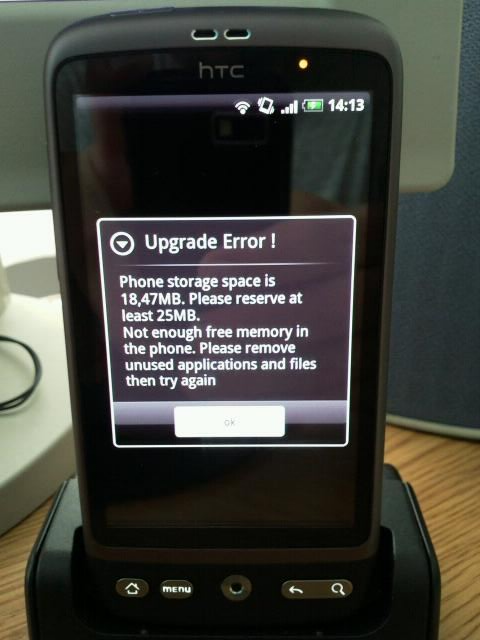 This update will initially roll-out to unlocked HTC Desire handsets. Operator specific versions of the update are undergoing testing and we expect to make them available in several weeks' time." So you can start pushing your "Update" button again until receiving the Froyo! Let me know if you got it! I am waiting for this update as much as all of you do! Screen 2: After first try of updating my HTC Desire to Froyo I got error! Screen 3: Second try - Froyo update in progress! Screen 4: My HTC Desire successfully updated to Android 2.2 Froyo! Update was easy and very fast (even with error during my first try). I was so excited about Froyo update availability I have not even read notification when I got it. I did it on the screen shot but it is not fully visible... And how about you... are you satisfied with Froyo on you Desire...? Does it meet your expectations...? Tags: Android, desire, froyo, htc, update. Google PageRank update in progress? Come on damn it! :) I cannae wait much longer! I’ve been one of those people refreshing my phone hoping for an update what seems like every 5 minutes. 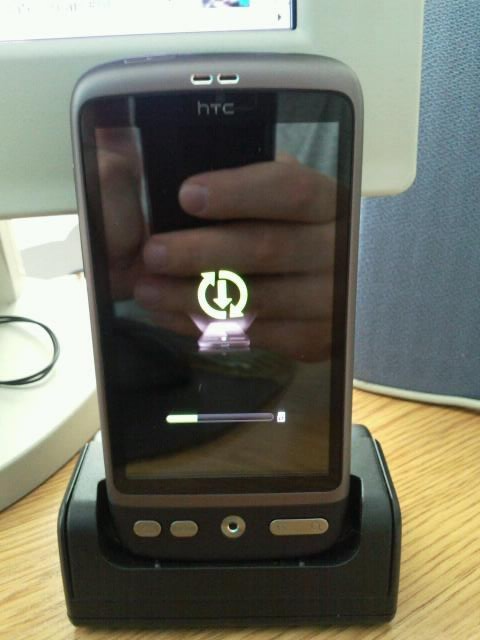 I have an Orange UK HTC Desire and can’t wait for this upgrade with all the new functionality. Flash, wifi tethering yada yada yada – eat that Apple! I have an Orange UK HTC Desire, knowing Orange it’ll be middle of December before we see Froyo and it’ll be loaded with so much rubbish it’ll be as fast as Eclair. If you want clean Froyo now you can use a Gold Card (or something similar). Check the XDA Developers forum for more info. Thanks for the update Snark – adding it to my post now! does anyone know if it will have the capability of putting apps directly onto the Sd card? please say yes. Yes it will have such feature. I wish I knew exactly what unlocked means, and how phones know which server to check for the update. Presumably different operators servers will have the file added to them at different times, and an unlocked phone will be checking an HTC server, and I guess further to this there must be some kind of handshaking going on to phase the downloading or the servers would fail. So again I guess that phones have some batch ID or individual IMEIs are fed into the server in a long list. Does anyone know? I have it NOW 13:10 on Sunday 1 August. Everything seems to work and it is soooo fast. Bye Bye iPhone(but can’t make calls) 4. Just to clarify i bought my HTC Desire SIM Free so I guess I am one of the lucky ones ! I’ve got the same sort of question as Alan. I got my HTC Desire on contract with Orange UK in May. Last week I got it network unlocked, which was done by Orange and cost me £20 (they send you an unlock code). My question is… Which server will the Android software on my phone look on for the Froyo update? Is it an Orange server or an HTC server? My phone is now unlocked to any network, I don’t want Oranges cack version! I am not sure but if they have just unlocked your sim you will still get an Orange version of Android. But if they have changed your firmware (removed Orange apps, wallpapers etc.) then you will get it straight from HTC. Thanks KreCi for the reply. My firmware is the same, that hasn’t altered. So does this mean that even after network unlocking my phone I’ll still get Orange branded update? You’d think there would be a server setting, which when unlocked you can change to get the unbranded version of the Android update. I think that it is most probably that you will get branded Froyo. One of things that may confirm it is that if you would be going to get a HTC update – you should already have it (as all unbranded devices). If you want to change your firmware and get unbranded updates in future – check the xda forum for description.